*This recipe serves 4 to 6. Preheat the oven to 180°C/gas mark 4. Line a baking tray with tin foil. Place the minced beef in a bowl and season generously with salt and pepper. Form into approximately 24 small meatballs and place on the lined baking tray. Cook in the oven for 15 minutes. Meanwhile, warm the olive oil in a large heavy-based pan set over a medium heat. Add the onion and cook for about 5 minutes, until softened but not browned. Add the garlic and spices and cook for 1 minute more, then stir in the chopped tomatoes. Simmer for about 10 minutes, until the sauce has reduced a bit. Season to taste with salt and pepper. Take the meatballs out of the oven and stir them into the sauce. Cover the pan with a lid and cook for 10 minutes more, until the meatballs are completely cooked through. Place the couscous in a large heatproof bowl and pour over the hot chicken stock and lemon juice. Cover tightly with cling film and leave for about 10 minutes, until all the liquid has been absorbed. Use a fork to fluff up the couscous, then stir in the parsley. To serve, divide the couscous between wide-rimmed bowls. 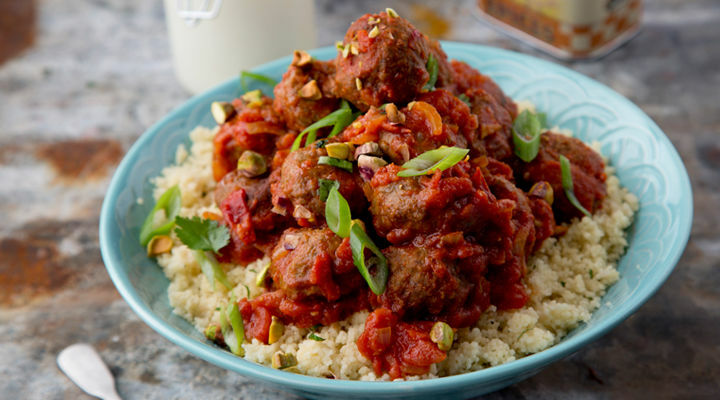 Ladle over the meatballs and tomato sauce and garnish with a dollop of yogurt and some spring onions, pistachios and fresh coriander.